Remember my Sun and Fun in Brussels? The good folk at we are social thought you and a friend might like to have some fun in Brussels courtesy of Eurostar little break, big difference . We are social will short list to 5 the most amazing/brilliant/wittiest of you. I will draw one of those out of a hat the following Friday. Easy Peasy. The first one is big ben London. The second one is Covent Garden. The third on is London Eye (at night). Loved all these posts. I seriously need this holiday as my hooligan girl-children are not only driving me to guzzle copious amounts of alcohol and sucking on extra cancer sticks, but I my temples are transforming into salt and pepper. This melancholy makeover is much more disturbing than the damage that fags and booze are doing to my lungs and liver. It’s vital that this holiday be mine, as my unfortunate husband has a to put up with a grumpy, intoxicated and soon-to-be middle-aged red-head. So, in conclusion, I’m doing it for my marriage – poor bugger! Oh, and I will be tweeting this lots and I posted on my bloggy too. Can I do anymore? Did I ever tell you about my tall elder sibling? Big Ben(1) to his mates, anyway, everyday as the clock struck noon he'd peel open his favourite carton of Covent Garden(2) soup and glug it straight from the pack in one go and then neatly dab a napkin to his mouth. He was so regular that his co-workers could set their clock's by Big Ben's soup feasts. Including the day his lovely sister treated him to a tourist day out in London for his birthday. In the queue for the London Eye(3) as Big Ben tolled, our Big Ben covertly produced his soup from a pocket and performed his lunchtime ritual. "It's my favourite flavour, it's the only one I like, it's Brussels sprout!" With a little break, big difference I'd like to craft stories while enjoying my first ever Eurostar journey and taking in the sights of Brussels. No more sprout puns if I win, I promise! He's Winston Churchill checking the time. That's in Covent Garden, the only Italian piazza in the UK. That was the London Eye just before it rolled away along the Thames. Sorry, if I came to London I'll never leave for a short break to Bruxelles. Only exception an Eurostar trip. hope your winner enjoys the trip - if I could get to London I might have a go but can't so won't. Nice competition ,i enjoy reading the comments , best wishes to all participants ! I agree with everything "goodeda1122" said above. In fact, I couldn't have said it better myself! 1. Eiffel Tower - tourist in the way of camera. 2. Red Square in Moscow - Ukrainian tourists. 3. A giant FAN used in Cairo. EAGAN daily photo - cheers! The 1st one is big ben London. The 2nd one is Covent Garden. The 3rd on is London Eye. I would really like to take my sister to Brussels where she lived for a year. It would allow us to have a girlie weekend and to eat lots of waffles and mussels and to discover or rediscover all the places to described in your post on Brussels. Reading that post made me feel like jumping in the first eurostar to go to brussels! Would love to go but I live in SA ... and you're not giving away plane tickets from SA to London as well, are you? 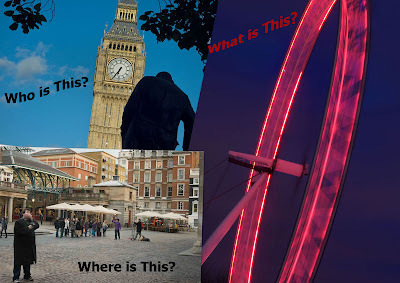 Winstin Churchill-Covent Garden and London Eye are my answers. "Whether I win or not win this break, it has been worth taking part because it shows that my Internet connection is working at the moment!Yuppy!" I left my competition answers via your email contact address. Will try again - as something happened with my email I guess. So you see.... I need a bit of respite in Brussels - to get the holiday my hubby won't cough up for, to indulge in my passion for exploring different cultures, art & it's people, AND I will probably come back a bit fitter - from walking around the city - so I'll be in better shape (physically & emotionally) for future modelling jobs and less scary to look at because of the big smile I will have on my face from being a lucky winner. So, in short, it's a win-win situation! Covent Garden , Big Ben, London Eye!!! I want to go to London so badly I can taste the fish and chips. I was raised in a lower class home and never got to travel much. Growing up my ways to escape were watching films. I remember seeing films like Mary Poppins, Candleshoe, Bednobs and Broomsticks, Peter Pan, and more and just kept thing over and over again that London and England must seem like a magical place. I have yet to be able to get over there but still keep the dream alive in my heart. Big Ben, Covent Garden, London Eye. Well, here we go I have to join in. Went here last year just before christmas and have to say what a beautiful place it is, was really amazed by the place, the people are so friendly and everything was just perfect.